My Asolo boots now have friends . . . a pair of friends, to be exact. The weekly REI visit, to consult with Kumar the shoe wizard about a bit of a problem with my left toes on my 6-mile walk the other day, resulted in two purchases: hot pink boot inserts which might solve the toe problem, and a pair of Salomon XAComp 6 trail runners, which have enough support for a Camino trip and are waterproof. Perhaps the Salomons will be the perfect second pair of footwear for the Camino, and in the meantime, they will serve me well this summer on walks in Ouray near Neil’s cabin. I’ll need several walks with my new foot companions to see whether we are compatible with one another, but I’m learning that this is the way of all the equipment I will take with me. Oh, and Kumar leads treks in his native Nepal. He grinned as he told me I’ll be ready to trek around Annapurna after the Camino. I think I’ll have to remind him that one elephant is all I can eat at this point. But he’s planted a seed . . . don’t want to get ahead of myself. I’m no longer 40 or even 50 or 60 years old, and try not to add too many things to my already long Bucket List. 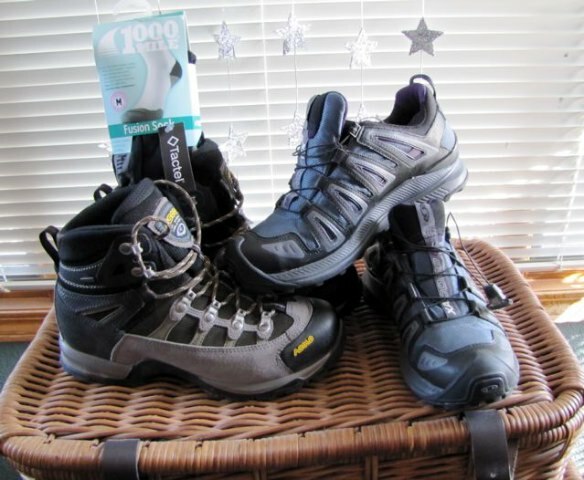 This entry was posted in Bucket List, Camino de Santiago, Nepal treks, Preparation, Spain, Women Walking and tagged 1000 mile socks, boots, equipment, shoes. Bookmark the permalink.